This text is faint, it’s also behind glass—so it’s glary—and despite its oversized type face it requires pause. Occupying the same room is a collection of blunt, padded bodies suspended from a wire frame. Bourgeois’s overstuffed fabric forms are the opposite of the gallery’s hard architecture. This confessional mode, in its restraint and control, and its sporadic, embarrassing release, acts like a kind of Butoh. Simultaneous channelling and restraint demands either great concentration or great drunkenness. In an interview recently, Lena Dunham summed up the flawed character she has written for herself in the television series, Girls, as ‘a few years younger’ than herself. What exists in the lag between day one and the time when we start to form words in order to communicate haunts our speech and writing, to our advantage and disadvantage. Unfortunately, we can’t control who looks on. Fortunately, this gap gives us a mode of truth and freedom. So let’s just say we’re making artworks that are barely disguised objects or tools for self-analysis. Let’s say we’re curating our biographies and hang-ups in an attempt to work them out a little. Let’s say that as writers we’re struggling not just to describe the material we are commissioned to, but rather struggling to describe ourselves. I guess this is all more compelling via a knotty, unresolved, self-questioning. 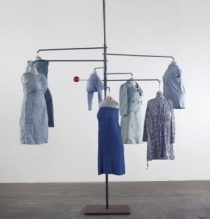 Louise Bourgeois: late works, Heide Museum of Modern Art, Melbourne, 24 November 2012 – 11 March 2013.